Devoted exclusively to the best in new independent music. An excellent source of folk recordings with detailed booklets on sources. Distributor of progressive political music in the United Kingdom. 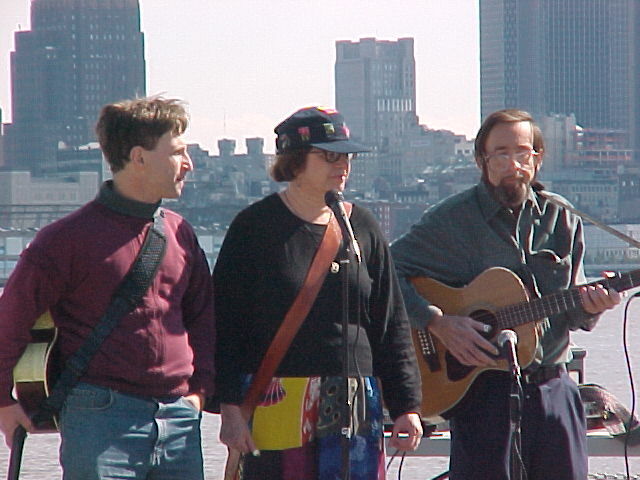 Officially called the Folk Music Society of New York, Inc. Anne is a longtime executive board member. Folk concerts throughout the year, special events, and three folk weekends per year (February, May, November). The New Jersey counterpart to New York Pinewoods, this club runs a weekly coffee house called the Minstrel in Morristown, New Jersey, and has Fall and Spring "Festivals" similar to the New York Pinewoods weekend. Fine music with a political slant. Presents a show most Saturday evenings from September through May. A marvelous festival of folk dance and music from around the world in Massachusetts every April. Wonderful festival of traditional folk music, in June at Altamont, New York, near Albany. A reconstructed 19th-century village in Connecticut, with sailing ships, craft demonstrations, and shantymen, great to visit all year round. Wonderful festival of sea music in June. Near Plymouth, Massachusetts, beautiful wooded camp with two lakes. Folk dance and music weeks throughout the summer. At South Street in New York City. Sailing ships and sea museum. Weekly concerts of sea music in the summer, monthly the rest of the year. An online folk music forum and source of folk lyrics. If the song you're looking for isn't in their database, post a question and get dozens of replies within hours. Also chat on any subject of interest to folkies. People's Music Network/Songs of Freedom and Struggle is a network of musicians, performers, songwriters, sound and recording engineers, music lovers, record and concert producers, promoters, activists, and more, using music and culture to promote progresssive ideas and values. PMN holds two weeken gatherings each year, one in January and the other in June. A friend from Rochester, New York. Performs historical programs at Genesee County Village and Museum, and plays many instruments with several different groups. Sings funny songs, rounds, swing, and other kinds of music with Double Trouble, Triboro, and the Rounds Galore and More Singers. Sings and plays Old Time music and traditional ballads. Plays banjo, guitar, and concertina. Strong-voiced women sing songs of the sea. New York Pinewoods Folk Music Club board member, Heather is the only surviving member of the Young Tradition. Heather was also a member of Poor Old Horse, who did sea music and Copper Family style English folk songs. Orrin is a hot bluegrass musician who plays with the Sultans of String. He recorded and played instrumentals on Anne's CD Hearth and Fire. English folksinger who had been a member of Poor Old Horse along with Heather Wood and the late Tom Gibney. David now lives in New Jersey. Singer and writer of political songs. Active in People's Music Network. Has TV show Songs of Freedom on New York City cable and on the web at www.mnn.org. Member of MacDougal Street Rent Party. Knowledgeable folksinger on the folk scene since the 1960s. Friend, frequent musical partner, and fellow member of MacDougal Street Rent Party. Folk Project organizer. Skilled musician, strong on humor. Writes and performs songs of social justice. Also a fine recording engineer who recorded, mastered, and mixed Anne's CDs . • Go to Anne's home page. For bookings contact Anne at aeprice@aol.com.